In her short story collection Astray, author Emma Donoghue takes us on a journey that leads us through time and across oceans deep into the lives of people both real and imagined (sometimes a skilful blend of the two). We encounter their hardships, bear witness to their darkest deeds, share in their triumphs, and hope, very much hope, that a happy ending is just over the next horizon. Following each story is a brief explanation of its origins, including the facts that inspired the fiction. More than once I found myself surprised by which pieces were true, and which made up – evidence, I think, both of Donoghue’s powerful imagination and reality’s tendencies towards peculiarity. A zoo keeper makes a decision about his beloved elephant; a young soldier acts against his better judgement to follow orders; a Creole girl divines her family’s past using the bible and a shining charm bracelet; a woman discovers that her deceased father was a woman. Some of the stories will sweep you along more than others, and likewise, some characters, but not all, leap and soar from the page, crackling with life. Prospector, cowboy, cook and saloonkeeper Mollie Monroe of The Long Way Home is a particular joy, while in What Remains, the tenderness and frustration of sculptor Florence Wyle dealing with the senility of her beloved Queenie offers an insight into the migration many of us make at the latter end of our life, far beyond our control. Donoghue’s stories are both alien and familiar, run through with both a yearning for home and a perilous hunger for the future. 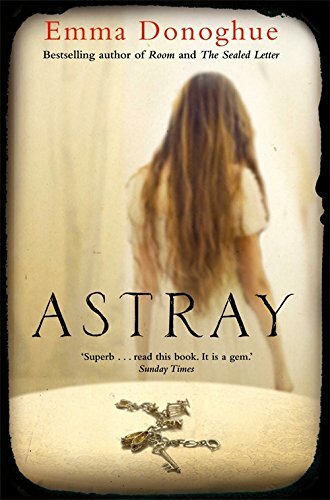 Astray by Emma Donoghue is published by Picador and available to buy from Amazon. This entry was posted in Reviews and tagged Astray, Emma Donoghue, short story collections by Judy. Bookmark the permalink.